CHICAGO (Reuters) - U.S. farmers are gearing up to plant what could be their third-largest soybean crop ever despite failing to sell a mountain of beans from their last harvest due to a U.S.-China trade war that remains unresolved. But Chinese tariffs have almost halted the trade, taking the biggest buyer out of the market and leaving farmers with crops they cannot sell. The U.S. government estimates farmers will have 900 million bushels, or approximately $8 billion, of last year's soybeans in storage silos around the country when they start harvesting the next crop. "It is tough to rotate out of soybeans because what else are you going to plant?" said Darin Anderson, a 41-year-old farmer from Valley City, North Dakota. 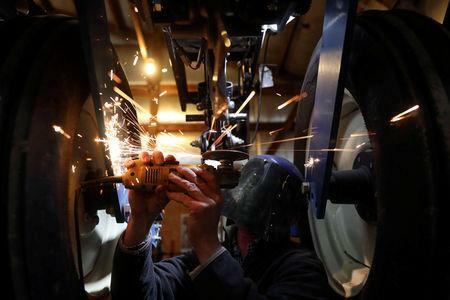 "Farmers have made long-term investments whether it is equipment or storage," said Josh Gackle, a 44-year-old farmer from Kulm, North Dakota. "All that is very specialized and the transition to something else takes a new set of investments." "It is not a lot of gravy by any means," said Austin Rincker, a 30-year-old farmer from Moweaqua, Illinois. "But with a good crop, we could still maintain some profitability." 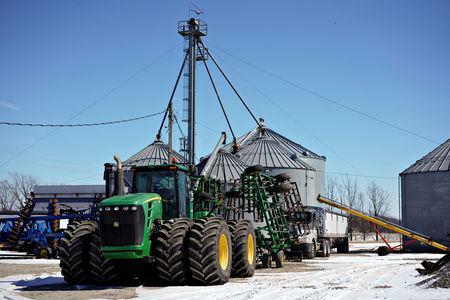 "It is nice to know it is there," said Art Bunting, an Illinois farmer who typically opts for plans that cover 85 percent of expected revenue, the maximum amount offered under the plans. As well as the insurance, farmers were able to tap the government aid program to boost the profit on their 2018 crop. The bulk of the program's budget was devoted to soybean claims. The USDA has said repeatedly the package was a one-off deal. "It's going to be bloody out here in farm country," without a trade deal, he said. The USDA expects China's annual soy imports to fall this year for the first time since 2004. China has booked just 11.0 million tonnes of U.S. soybean shipments since the marketing year started on Sept. 1, 2018, down from 28.2 million at the same point a year ago. The country's total soy imports for the year are expected to be 6.5 percent below last year. A fast-spreading outbreak of African swine fever reported in 28 provinces and regions has led to mass culling and reduced China's demand for hog feed. China has also tried to boost the amount of alternative feeds used in livestock rations to reduce its dependence on U.S. imports. 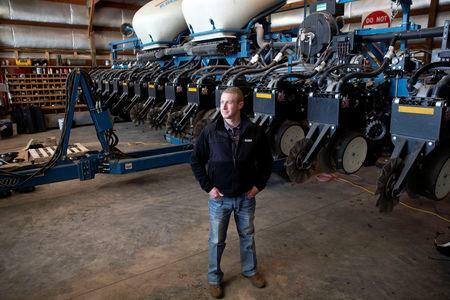 "I think the demand will continue," said Roger Hadley, a 66-year-old Indiana farmer who is aiming to divide his 1,000 acres evenly between soybeans and corn this spring. "Their folks have got that taste in their diet."